Sutton is an area of St Helens, Merseyside, and Ward of the metropolitan borough of the same name. The population of the ward taken at the 2011 census was 12,003. Historically within Lancashire, it is one of the four townships along with Eccleston, Parr and Windle that formed the municipal borough of St Helens in 1868. The old Township of Sutton included: Sutton Village, Ditch Hillock, Peasley Cross, Marshalls Cross, Clockface, Sutton Manor and Sherdley and totalled 3,752 acres. The exact derivation of Sutton is uncertain. It is thought the township took its name from 'Sudtun', old English for southern enclosure or south town and was likely to have been the southern portion of a Saxon thegn's estate. Before the Conquest of 1066 AD, Sutton was held by King Edward the Confessor and located within the Royal Forest of West Derby. 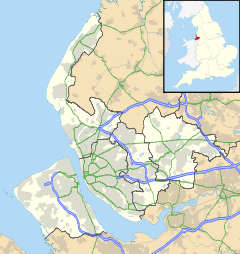 This extended from Burtonwood to Crosby and in the 12th and 13th centuries, Sutton became part of the Barony of Widnes. Along with fourteen other townships including Windle, Parr and Eccleston, it became part of the large ecclesiastical parish of Prescot and its rich seams of coal, which were first discovered in Sutton Heath around 1540, transformed it from an area of moorland and forest into an area of mining. There are two railway stations in the area. St Helens Junction, and Lea Green both operate services to Liverpool and Manchester. Sutton Manor was one of the largest pits in the Lancashire Coalfield, the deepest of the two shafts going over 2,000 feet (610 m) into the earth. Owing to their depth, they were not filled in: instead two three-metre thick reinforced concrete plugs were lifted into position over the two shafts, with venting pipes for methane. This has meant that annual surveys are carried out on the shafts; however recent surveys have shown that the shafts have little water in them. A 66-foot (20 m) tall sculpture, called Dream, is now sited at Sutton. The popular St Helens Show  or St Helens Festival as it has been rebranded over recent years, takes place in Sutton each July at Sherdley Park, adjacent to The Sutton Academy. ^ "St Helens ward population 2011". Retrieved 13 January 2016. Flickr Group Photographs of the site. This page was last edited on 2 March 2019, at 14:06 (UTC).